Each species has its own way to survive in this world. Snakes have already been known to be cold-blooded killers, merciless to their prey. But, are snakes caring parents? Snakes have never before been seen as good parents. Unlike humans, other mammals, and even birds which feed their offspring, scientists haven’t recorded a caring gesture of snakes towards their offspring, until now. Reptiles with the capability to lay eggs always ensure that the eggs are laid in a place that can be safe for their offspring. However, usually that’s where their care ends. Usually they leave the lair at that point, or as soon as the offspring hatch. Graham Alexander from Wits University, South Africa conducted a study that questions if snakes are caring parents. The study discovered that pythons from southern Africa (Python natalensis) remain in their nest until the eggs hatch, and even after to ensure that the offspring is growing well and healthy. However, caring for the offspring comes at a great cost to the mothers. The researchers collected the data for the study via infrared cameras in radio-tracked pythons that were laying eggs. They used eight female pythons to conduct their study. Those eight pythons were observed as they were taking care of their baby pythons for the two weeks after the eggs hatched. 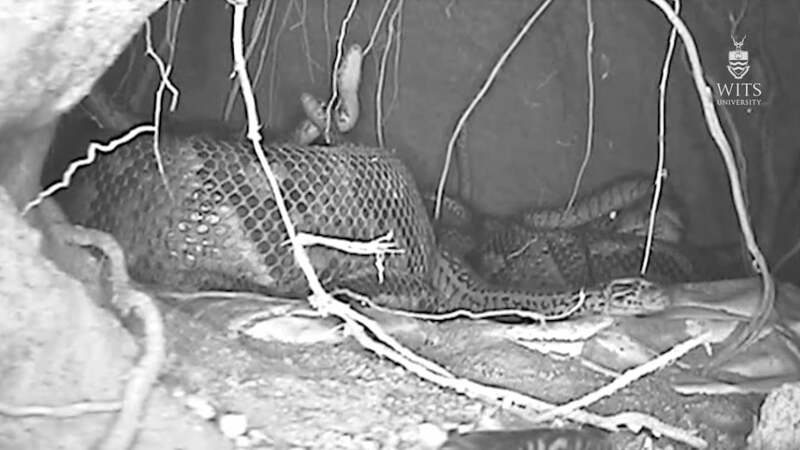 The snakes kept the babies safe and warm during the night, tucked in the mothers’ coils inside the nest. “This is the first-ever report of maternal care of babies in an egg-laying snake. I was amazed by the complex reproductive biology of this iconic snake,” Alexander said in a statement on Wednesday. However, this comes at a great cost for the mother python, which doesn’t feed itself during this whole process of the breeding cycle, which can last for longer than six months. The mothers usually lose about 40% of their body mass during this time. Scientists sometimes found that mother pythons have died after the breeding cycle, although all the pythons from the study itself survived. “All of this takes its toll on mother pythons: they take a long time to recover after breeding and so can only produce a clutch every second or third year, depending on how many meals they are able to catch in the months after leaving the nest. Some of them never recover. … Perhaps they just became too weakened to catch food,” he explained in the statement. Scientists discovered some other odd facts during this process too. Female pythons that weren’t breeding, pregnant, or receptive had lower body temperatures. Also, while the researchers observed the pythons, male pythons were following the receptive females for months. The findings of Alexander and his team were published in the Journal of Zoology and is based on a 7-year long research project. During that time, they studied 37 pythons in total in the Dinokeng Game Reserve, near Pretoria. So, are snakes caring parents? By the look of it, they are doing great for the cold-blooded animals that they are.